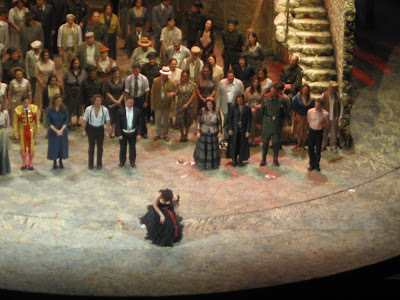 I'm still high from seeing Carmen at the Met on Wednesday night. What a way to begin the 2nd half of the season. This production is not only fun, but devastingly beautiful, breathtaking and sadly heartbreaking. The cast is perfect - Elina Garanca as Carmen, Roberto Alagna as Don José, Barbara Frittoli as Micaela, and Mariusz Kwiecien as Escamillo. It was well acted and even more beautifully sang. The Met Orchestra made each delicious note sound as if it was floating on air. I could not have been more enthralled by the story itself. The only thing I remember from the previous production, which I saw in 2004, was the hugeness of it as well as the spectacle. This new production allows one to focus on the story itself and it was if I was hearing and seeing it for the first time. There are more opportunities to witness this cast and I believe it's a must see.